It’s hard to know where to begin with this young man. His full name is Eldar Djangirov, and he was born in the former Soviet Union on January 28, 1987. His father had a Ph.D. in mechanical engineering and his mother taught piano. So perhaps it’s not too surprising that young Eldar began studying the piano when he was only 3 years old. When Eldar was 10, his family moved to Kansas City, Missouri, and at the ripe old age of 12 he was featured on Marian McPartland’s “Piano Jazz” radio program. He remains to this day the youngest person to appear on “Piano Jazz,” which went out of production in 2011. The personnel for this one varies considerably from track-to-track, so we’ll just take them as we come to them. I don’t intend to discuss all the songs, but I do intend to hit the high points. “re-imagination” consists of eleven songs, all but two of which Eldar wrote. Up first is “I Remember When,” a love song to his parents. It features Eldar on acoustic piano and keyboards; Marco Panascia on electric bass; and Todd Strait on drums. This is a very beautiful song, by turns exploding with energy and then softly whispering. Eldar’s keyboard style can be as bombastic as the late Dave Brubeck’s was, and it serves this song well. “I Remember When” is mostly a fast-paced song, and trying to imagine Eldar’s fingers flying from one end of the keyboard to the other leaves you breathless. “Prairie Village” is about Eldar’s childhood, which was spent in Kansas City from the age of 10 to 16. This is his love song to the first city he called home after his parents brought him to America. “Prairie Village” features Eldar on acoustic piano and keyboards; James Genus on electric bass; Mike Moreno on guitar; Terreon Gully on Drums; and someone who calls himself “DJ Logic” (known to his mother as Jason Kibler) on turntables, programming, and effects. Many of you will be turned off just by reading the final part of the sentence above. I must admit that, had I read the personnel list prior to listening to the music, I may very well have never listened to the disk. I am not into hip-hop or rap or what passes for R&B these days. Frankly, it is mostly crap masquerading as music. But. If jazz is to have a future, it cannot continue to live exclusively in the past. Eventually the barriers need to come down and jazz will have to either step into the 21st Century or die. Like it or not, the music has to evolve if it is to survive. Listen to me, speaking as if an entire musical genre was a person. And maybe it is, with the collective brainpower of every jazz musician working today consciously or unconsciously moving the music as a whole a little bit one way or a little bit the other way by their individual choices. The fact is that Eldar is a good-looking, extremely talented young man filled to bursting with musical energy, energy that demands to be released. It is only natural that he would chose to employ some of the techniques that modern technology has made available. You and I may not particularly care for those choices every time, but you cannot deny the genius behind what he does just because you disprove of the way he does it. So having said that, I dare you to listen to “Prairie Village” and tell me at what point would the song have been better without the contribution of the artist known as DJ Logic? I don’t think you can do it. “Place St. Henri” was written by Oscar Peterson, one of Eldar’s hero’s and the musician who had the greatest influence on Eldar the boy as he was becoming Eldar the pianist. Besides Eldar, this piece features Carlos Henriquez on acoustic bass and Ali Jackson on drums. This is a happy-go-lucky arrangement that includes a touch of boogie woogie now and then and never lets up its intense forward momentum. The final song I want to write about on “re-imagination” is also the longest on the disk, “Polaris”. Eldar describes this simply as a jam tune, as if that said everything that needed to be said. The musicians for this one include Eldar of course, plus James Genus on electric bass; Terreon Gully on Drums; Mike Moreno on guitars; and DJ Logic again. I’m not sure what a “jam tune” is supposed to be, but I can tell you that this comes across like a handful of guys gathered together to have a good time playing music they love. Personally, I have a love-hate relationship with this particular song, but as you have probably guessed by now this whole album is not for the faint of heart nor for those jazz purists who are not willing to expand their musical horizons now and then. Eldar likes to mix things up in his compositions, and many of his songs are robust and rambunctious one minute and quietly beautiful the next. “Polaris” is no exception to that. In the interest of full disclosure, I have to tell you that until I sat down to write about the CD titled “Eldar,” I had completely forgotten about “re-imagination.” I have listened to it several times this afternoon as I have been writing this post, and while I doubt I will ever like it better than “Eldar,” I truly have a lot more respect for it now than I did back when I was looking for songs to play on Saturday Night Jazz. If you are a jazz purist, then “re-imagination” is not for you. If you are a card-carrying member of the so-called “jazz police,” this album is not for you. If you feel that any musical instrument that involves electricity is the work of the devil and to be avoided at all costs, this album is not for you. Of course, by that standard, none of Jimmy Smith’s, Jack McDuff’s, Joey or “Papa” John DeFrancesco’s or any other Hammond B3 organ player’s albums are for you either. The B3, after all, runs on electricity. 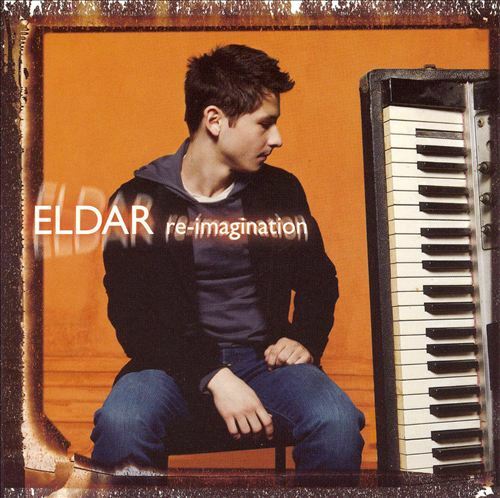 I think “re-imagination” by Eldar will make an eye-opening addition to your personal playlist, for a Saturday or any other night! To learn more about Eldar and his music, visit his web page. There is an interesting (and undated) interview with Eldar on the Interview Magazine website.